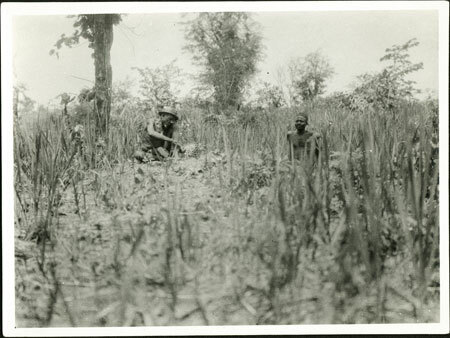 An operator of the poison oracle (benge) seated to the left (identified as Windis, also known as Zori vuru Gami (i.e. Zori a subject of the commoner governor Gami), and to the right Bawili wiri Bagbe, i.e. Bawili son of Bagbe). The oracle questioner is identified as Bawili, who is seated nearby to the right, addressing the oracle. The operator is administering poison to the fowl. Poison oracle consultations took place away from habitation, often at the edge of cultivations, so as to ensure secrecy and to avoid pollution and witchcraft. Notes on print/mount - "Windis & Bawili +76 46/3"
Notes on card mount m/s pencil - "SSS RCS 8.89"
E. E. Evans-Pritchard discusses the operation of the benge oracle in detail on pages 294-312 of Witchcraft, Oracles and Magic Among the Azande (OUP 1937). Two similar images, obviously taken at the same time, are reproduced as Plates XXIa & b (facing page 310) in E. E. Evans-Pritchard's Witchcraft, Oracles and Magic Among the Azande (OUP 1937). Morton, Chris. "Consulting the Zande benge oracle" Southern Sudan Project (in development). 03 Jan. 2006. Pitt Rivers Museum. <http://southernsudan.prm.ox.ac.uk/details/1998.341.763.2/>.